Residential and commercial snow plowing services, we remove snow from anything including rooftops. I know some homeowners are excited to see rain in the forecast instead of snow. Unfortunately if your roof is already overloaded with snow this will only compound the problem. It actually increases the danger of a roof collapse or damage inside your house. The snow will act like a sponge and soak up the rain, weighing down your roof even more. 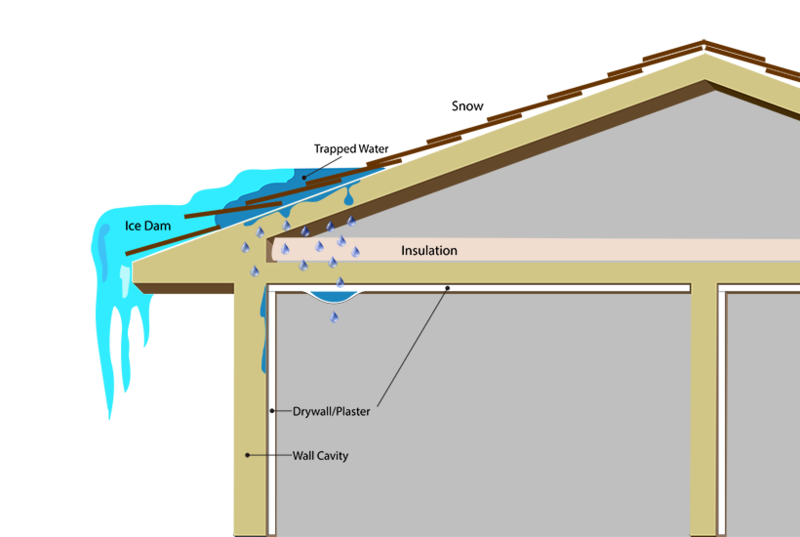 Ice damming on the edge of your roof acts like a barrier to the water that is melting and trying to run off the roof. Unfortunately that barrier holds back the water, and once the temperatures dip at night to below freezing the water refreezes on the roof, causing more damage. Now is the time to understand the importance of removing snow from your roof, and some of the consequences of neglecting that task. To put it simply, snow is heavy, and that weight increases when rain, ice, and sleet are added to the mix. Consider this: two feet of snow on the average-sized roof weighs 19 tons! That is 38,000 pounds, and all that weight stresses your roof and weakens its structure. When snow melts, it can seep into your roof seams and rot shingles, destroy insulation, flood attics, ruin gutters, and damage the interior of your home. To avoid disaster, keep your roof clear of large accumulations of snow, think twice before you climb up with a shovel. Safety and roof experts caution against that strategy – icy roofs are slippery. One wrong step could cause serious injury. In addition, any weight added to an already-stressed roof might be all it takes to cause your roof to collapse. Realize that the cost of snow removal is likely to be considerably less than the cost of roof damage or interior property damage caused by water leaks. A sagging roof is the most obvious sign that it is in danger of collapsing, but there are many other indicators. Creaking, cracking, or popping sounds; severe roof leaks; bowed pipes; cracks in the walls or masonry, and doors and windows suddenly difficult to open are all signs that your roof might be in trouble. Be aware of some of those same signs in your deck, which is also susceptible to collapse under severe snow and ice weight. Why Hire Grateful Ark Construction? Removing snow from roofs is dangerous and very strenuous. We have been SAFELY removing snow from roofs for over 15 years, from bungalows to colonials, to major commercial warehouses.